The purpose of traction is to apply a force that draws two adjacent bones apart from each other in order to increase their shared joint space. 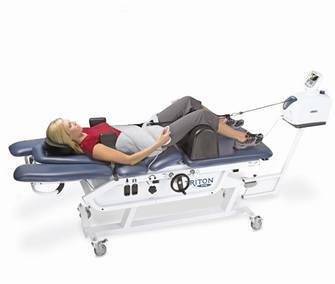 There are a number of medically accepted uses for spinal traction, which include the mobilization of soft tissues or joints, decompression of pinched nerve roots, increased circulation, and it relieves pressure on the spinal cord. Traction is sometimes given to people with spinal stenosis, as it helps to make space around the compressed spinal cord. In any case, the improved circulation has an added, indirect benefit of decreasing chemicals in damaged tissues brought about by inflammation. The movement at the joints may also contribute to the decrease of nervous excitability, which is another source of pain. Currently, the most important use of traction is for the management of cervical spine instability. Instability is defined as damage to the cervical spinal column, either through trauma or disease, resulting in a potential for shifting of fractured bones prior to healing or abnormal movement of the injured region with a likelihood of additional neurological damage. Traction is an extremely effective means of realigning a cervical spinal dislocation and providing stabilization for these types of cervical spine injury.